Have you ever woken up in the middle of night, hearing a strange noise, searched frantically in dark and discovered that there is absolutely nothing, but an eerie silence all around you, with just your own nocturnal shadow lurking devilishly on the walls? Or have you ever waited for the break of dawn, with a desperate chant on your lips, wishing to escape from the secure, yet scary walls of your own home, eagerly waiting for a whiff of fresh air? if your answer is ‘yes’ to any of these questions, you can understand the dilemma suffered by Sumitra Choudhary, the strong willed, yet fearful woman protagonist of the story, “An Evening Walk” written by Bhabendranath Saikia in Assamese and translated in English by Ranjita Biswas, for whom these events are a part and parcel of her daily life. Sumitra is a College lecturer, well settled in her career. But, she has an inescapable void in her life. With her horrendous experience with the males, she prefers daggers and revolvers for her protection much more than any man. However, her life changes, when she decides to construct her own house and comes in close proximity with two men. Will these men change her attitude towards life or whether she will happily break away from these temptations and carry on her dignified silence? All this and more is explored in the wonderful “An Evening Walk”, that is the first story of ‘Contemporary Indian Short Stories’ and sets the mood of the book as curiously romantic. I love reading short stories for their terseness, single agenda approach and the fun filled entertainment, they can provide within a short span of time. However, having said that I do not really like collection of short stories, as, usually, only the first few stories of the collection are good, with the creative talent of the writer evaporating with each successive ones, becoming repetitive and boring. So, I often shy away from such collections, despite the fact that ‘Accursed House’, ‘Cabuliwallah’ and ‘Living or Dead’ are my eternal favorites and I can read these stories as many times as I want. 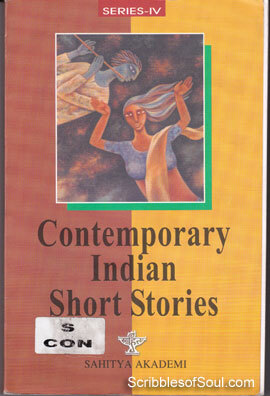 However, despite my well meaning apprehensions, ‘Contemporary Indian Short Stories’ published by Sahitya Akademi caught my fancy. The main motivation was, this collection does not boast of a single writer, but, is a nice bouquet, with exotic flowers plucked from various regional languages of our great country. In fact, it has 21 stories in all, and all of them but one are translated from the local dialects of India, including Hindi, Dogri, Punjabi, Oriya and Malyalam. My exposure to Hindi and other regional literature has been minimal, restricted to Prem Chand and Amrita Pritam. So, as a true lit-aficionado, I decided to dive deep into the vast Indian ocean and collect some rare gems. Though, I am still at a loss to understand why the first story was called ‘An Evening walk’ while all the action takes place in the mind of Sumitra during her morning walk. But, I am ready to overlook it as a translation mistake or a typo. And, I must say, I was not disappointed with the collection, which is bound by the themes of single women, emotions of love, hate and jealousy and a satiric, yet entertaining take on politics of our society as well as the country. Nevertheless, ‘An Evening Walk’ proved to be an auspicious step in my journey and to add icing to the cake, elegant Sumitra was followed by the innocent Saugandhi, a young woman in her thirties, who could not get married, despite several failed attempts by her over protective parents. In ‘Soliloquies of Saugandhi’, the writer Vaidehi gives a sneak peak into the delicate mental state of a single eligible woman, under pressure to maintain her dignity and moralities despite her desperate cries for freedom and companionship. I liked the story for its frankness, its ability to see beyond the hazy curtain of shame and honor, which is often superimposed on a girl, against her wishes and desires. The third story, that I really liked in this collection is ‘Sunshine’ written in Kashmiri by Hari Kishan Kaul, which revolves around the life of an old widow, who is expected to change with time. But, the cynics of her old age makes her an outsider in her own home. She leaves behind her poor elder son, and is weary of her daughter-in-law, and joins her younger nouveau rich son in Delhi. But, soon she finds herself estranged in her new home as well, struggling hard to cope with younger ‘Bahu’s’ city culture. Whether, it is her behavior, or the unguarded jealousy that makes her dislike her own blood, is dealt with in this third story. Though, there were many more stories on the theme of single women in the Contemporary short stories, and each of them were extra ordinary in its own way, these three portray the predicaments and challenges faced by the women in our society most convincingly and remain my favorites. Further, I really liked Dogri story ‘Bal Kak and Nono’ by Ved Rahi, that speaks of an unconditional, selfless love, binding an old soldier Bal kak to his pet dog, Nono. The story begins with a critically ill Nono on his death bed and showcases the desperate attempts by Bal Kak to save his life. The story just bleeds with emotions, slightly touching upon the terrorism in Kashmir that rendered several Kashmiri Brahmins homeless and left me in tears. Loved the story for its unique and sensitive approach. Another story, revolving around animals that touched a chord in my heart is ‘The Guest’ written in Bangla by Sayed Mustafa Siraj, and quite contrary to the earlier story, showcases the greed of men and the disastrous consequences it can have. There are, in all twenty one stories in this collection, and I liked quite a lot of them, which include “The Heir”, “Cannibal”, “The Bell”, “The House” and “Retelling”. Though, for scarcity of space, I won’t be able to discuss all of them. But, this collection did dispel my earlier apprehensions, making me aware of the enormous talented regional authors and I feel, I would be able to enjoy more such collections in future.